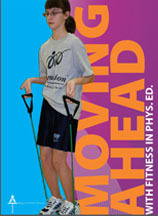 Moving Ahead with Fitness in Phys. Ed. is a resource created by Regina Catholic Schools. This resource is designed to give teachers the background knowledge and skills to integrate fitness into their daily physical education instruction. The approach used encourages students to take personal responsibility for maintaining and improving their health-related fitness level as well as some components of their skill-related fitness. The resource aligns with outcomes the Ministry of Education’s Physical Education curricula and can support students in learning the key skills and understandings needed to set personal fitness goals and work towards them. Download both the Teachers Guide and the Exercise Posters - Lower Body, Core, & Upper Body. All video exemplars can be found on the Saskatchewan Ministry website.